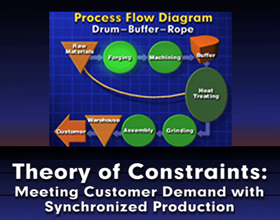 Part of the award-winning Manufacturing Insights Video Series, this program introduces the Theory of Constraints and demonstrates how it is applied in production scheduling to meet customer demand. Three companies that have successfully applied the Theory of Constraints demonstrate how the theory's five focusing steps can infuse continuous improvement into the culture of an organization. Brenco (Petersburg, VA) has practiced the theory for many years, synchronizing production to supply millions of roller bearings to the global railroad industry. Dixie Iron Works (Alice, TX) uses the theory to remain highly responsive to customer demand without carrying the high inventory levels traditionally found in their industry. Monroe Table Co. (Colfax, IA) implemented the theory in a manufacturing environment that had not seen significant change in more than 40 years, and consequently increased the assembly of finished tables by more than 30%. Dr. David Bergland, a consultant and professor at Iowa State University provides additional insight into the Theory of Constraints. Brenco (Petersburg, VA) has practiced the theory for many years, synchronizing production to supply millions of roller bearings to the global railroad industry. Dixie Iron Works (Alice, TX) uses the theory to remain highly responsive to customer demand without carrying the high inventory levels traditionally found in their industry. Monroe Table Co. (Colfax, IA) implemented the theory in a manufacturing environment that had not seen significant change in more than 40 years, and consequently increased the assembly of finished tables by more than 30%. Dr. David Bergland, a consultant and professor at Iowa State University provides additional insight into the Theory of Constraints.